You know how they say big things come in small packages? Never has that saying been as true as it is with the Polk MagniFi Mini. From the moment I opened the box to this very second, this soundbar keeps on blowing my mind with how good it is. Impressive sound? Check. Plethora of options? Check. 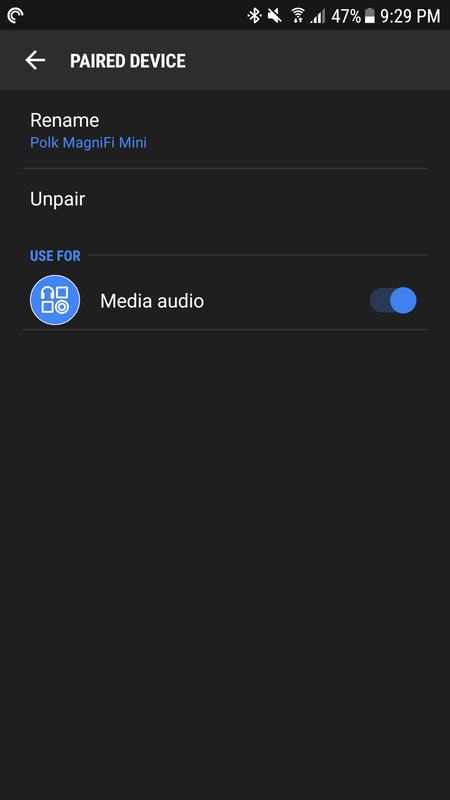 Chromecast built-in and Google Home compatibility? Check. Small form factor that could fit in front of many/any TV? You betcha. I could easily end this review here, but I'll do my job and write a few thousand words below... while listening to some music. It'll make the task more enjoyable. So let's rewind and start the story at the beginning. 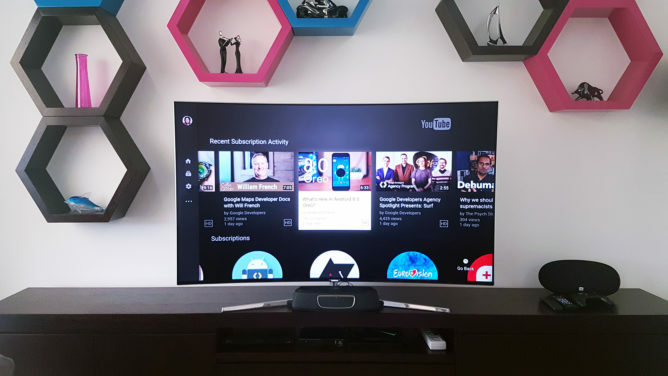 The moment my husband and I unwrapped our brand new 55" Samsung TV and installed it in our living room, we realized one thing: we had made sure the TV fit on the big living room table, but we did not account for an additional soundbar. 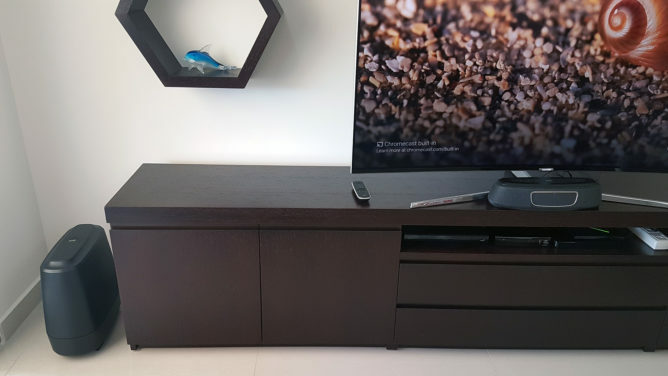 The TV model we got has a large and deep (45cm) stand with a design that makes it impossible to fit any soundbar in front of it or any soundbase below it. And we didn't want to hang a curved TV on the wall to make room for something below it, so we started searching for solutions. We also wanted something with plenty of input options and, ideally, Chromecast built-in, which narrowed our search considerably. 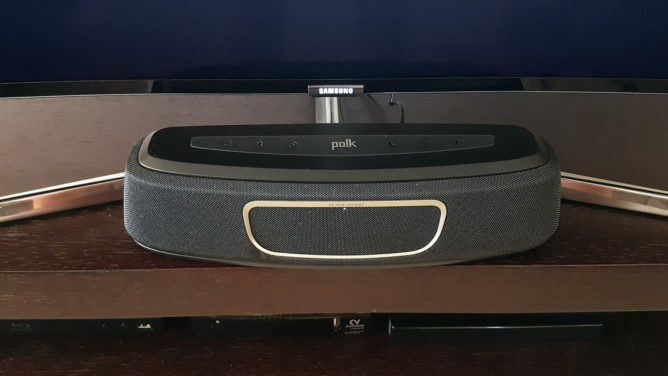 Traditional sound systems with a Chromecast Audio seemed like our only option until I stumbled on the Polk MagniFi Mini. On paper, it promised to provide everything we wanted and then some. 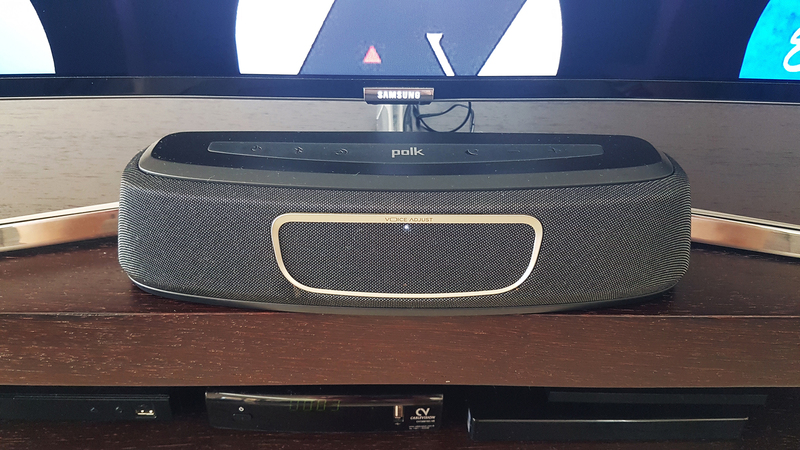 I had vaguely heard of Polk Audio before, so I wasn't ready to claim victory yet and I had to test it out for myself. The result, as you read at the beginning, was love at first sight and sound. Size At 13.4" (34cm) wide, the MagniFi Mini is one of the most compact soundbars there is and fits easily in many cramped places. Sound Despite the size, the sound this little unit provides is clear, and powerful, and engulfing. Versatility The plethora of input methods and audio modes means the MagniFi Mini works for different setups and use cases. 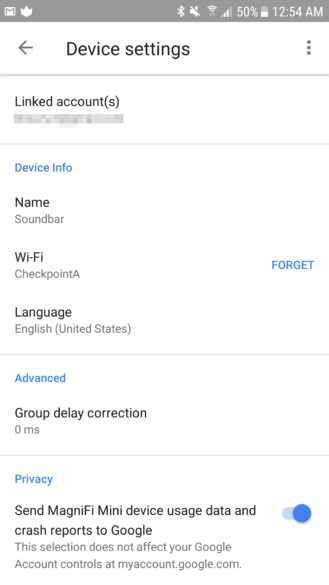 Chromecast built-in Soundbars with Chromecast built-in are few, and compact ones are nearly inexistent. 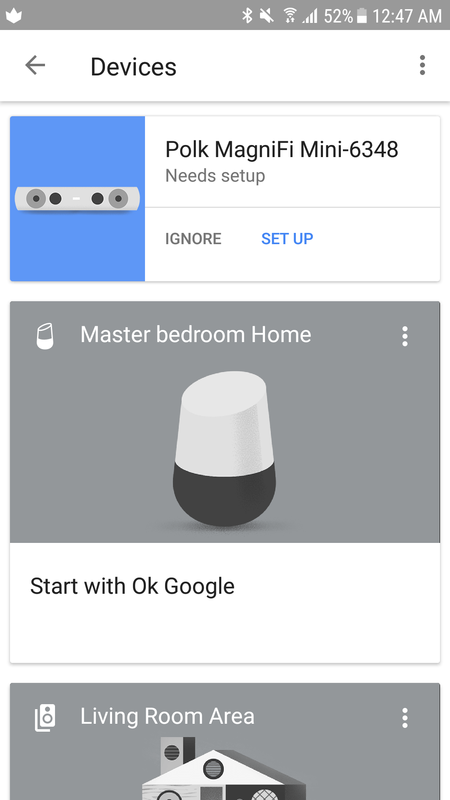 This has it and thus supports manual casting, grouping and multi-room, and Google Home integration. Price $299 MSRP is realistic given the features, and it can often be found slightly discounted to $270. 2.1 channels If we're nitpicking, and I really am here, I'd prefer a 5.1 channel system. But that would require a larger size which defeats the whole point of the Mini. 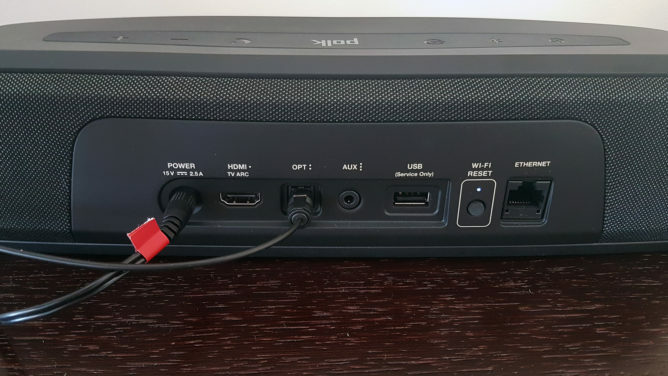 While the MagniFi Mini ships in a huge box, the soundbar itself is small. How small? The whole thing is 1.12ft wide. And while the depth is said to be 4.3", that's taking into account the curved front, so the unit is actually smaller than that. The result is that it fits in front our TV perfectly. Any wider and it wouldn't slot into the triangular space in front of the stand this well and would be pushed to the front and off the table. I'm still amazed by that. It's like it was made to fit in front of Samsung's curved TV stands. Not everyone has this same TV stand, but there are plenty of brands other than Samsung making weirdly shaped stands and plenty of living rooms and table setups where there's little to no space for a traditional soundbar. 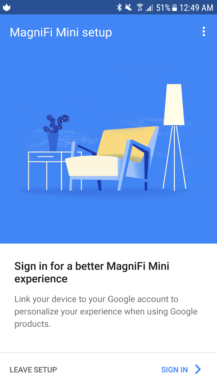 The MagniFi Mini could be the solution. You still have to account for the wireless subwoofer, but space on the ground isn't often an issue, at least not as much as it is on shelves. Also included in the box are the subwoofer and all the cables you might need to get the MagniFi Mini set up. 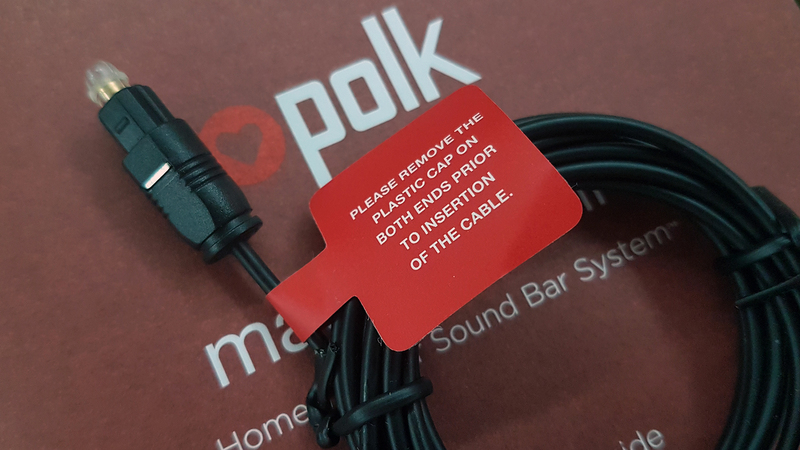 There are power cables for both the soundbar and the subwoofer (and an adapter for the latter), an optical cable (6ft), a 3.5mm cable (6ft), an HDMI cable (6.5ft), and the remote. Everything is thought of, even the cute red tags that explain things in case you're in such a hurry that you don't open the manual before starting to set things up. It's those little touches that make you feel at ease from the moment you open the box. 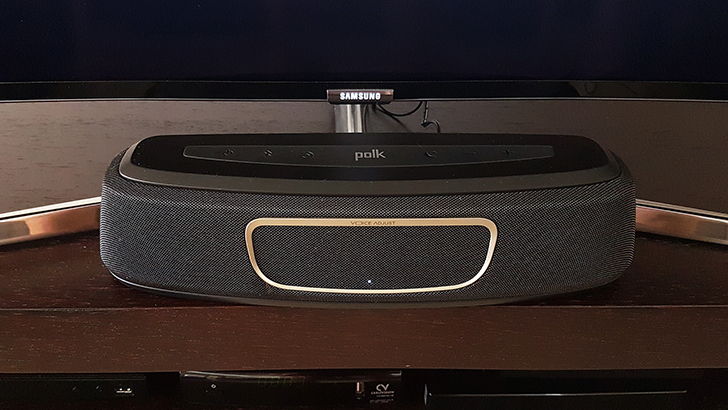 The soundbar may be small, but the subwoofer that comes with it is slim but big. But that's a sort of an expected size for a subwoofer. Since you'll be placing this on the floor, most likely in a corner, you won't likely worry about its size though. The MagniFi Mini has a slightly trapezoid shape with the top a little narrower than the bottom. 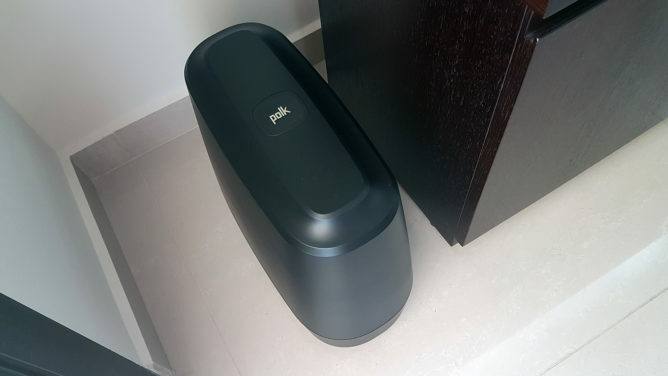 The whole unit is black, but the top and bottom are made of plastic with the button array made in a rubbery (and dust-attracting) material, while the front, sides, plus most of the back are covered in a grille. Beneath the grille are the MagniFi Mini's two tweeters and four drivers. 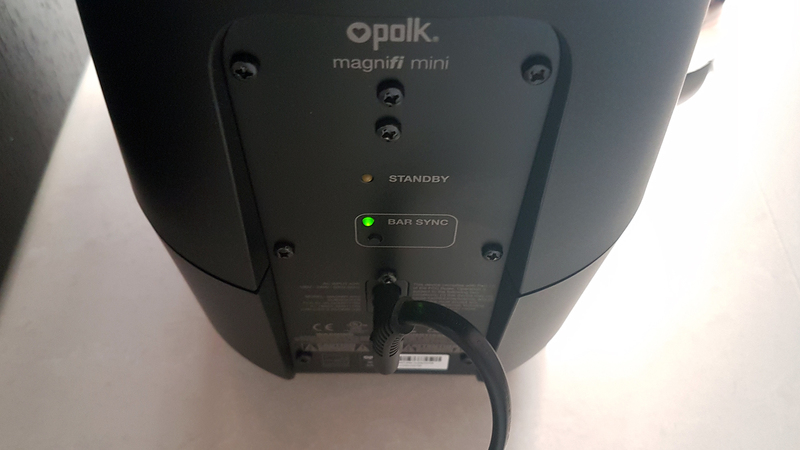 The front also has a nice metallic rim in the center that focuses the attention on the LED lights: 5 of them turn on and off in different patterns to indicate what's happening on the MagniFi Mini. They fill up from the bottom up when you're raising the volume, they switch to bottom-red and top-white when casting is on, they change to a unique pattern with each input mode (AUX/optical/HDMI), the bottom one turns purple when night mode is activated, and so on. They're useful and not bright enough to be distracting in front of the TV. 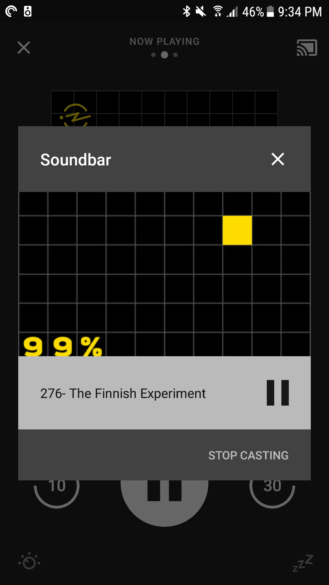 Full volume (left) and casting mode (right). As for the subwoofer, it's your typical black plastic affair with large rubber feet and one 6.5" round subwoofer on the bottom. 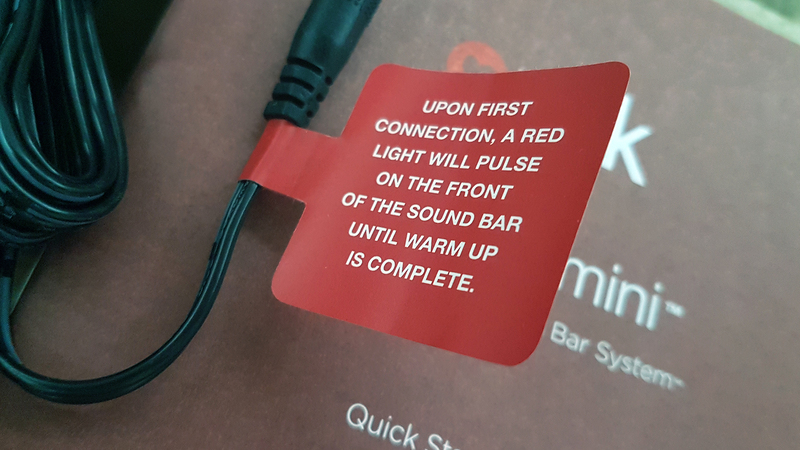 The controls can be found on the top of the soundbar and on the remote. 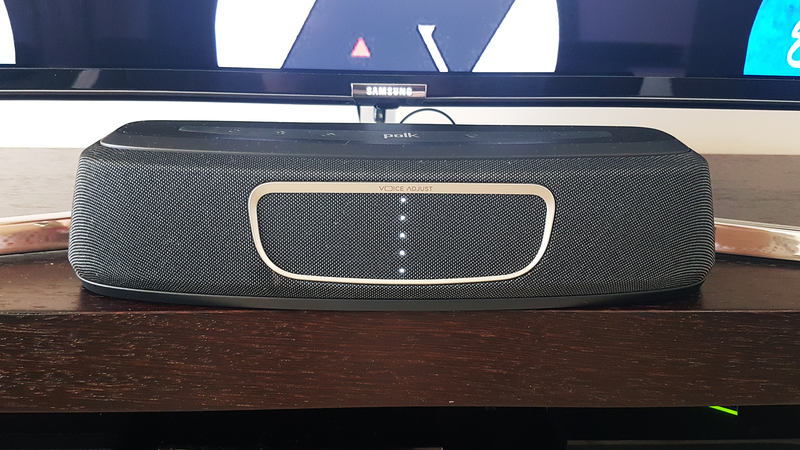 The soundbar has power, Bluetooth, source input, night mode, volume down, and volume up. 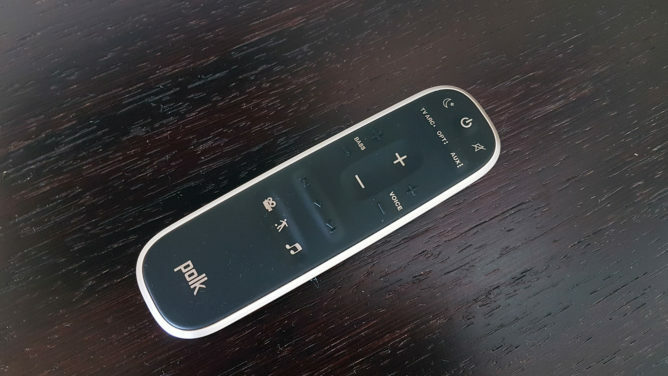 The remote has a lot more options, including a mute button, separate + and - controls for bass and voice beside the regular volume controls, media playback controls, and three mode options for movies, sports, and music. I wasn't expecting this wealth of options, especially the separate bass and voice controls and the different modes, so I was pleasantly surprised to see them there. 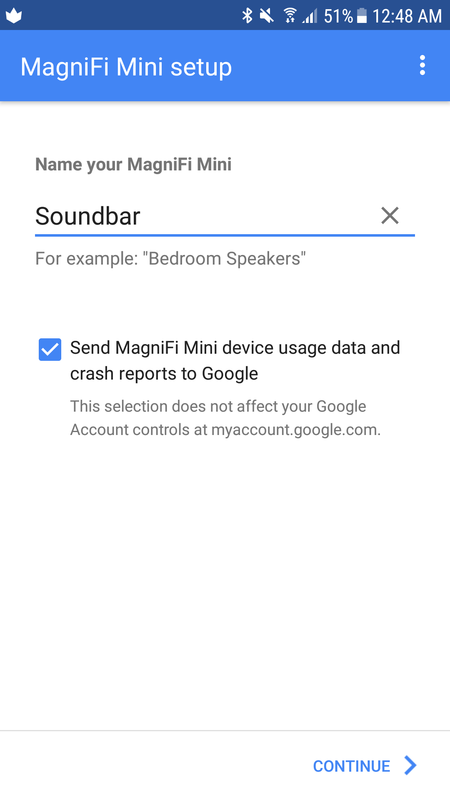 For such a small soundbar, the MagniFi Mini doesn't skimp on inputs. Beside the wireless options, WiFi and Bluetooth, there's HDMI (ARC), Optical, and AUX 3.5mm. Another HDMI port for passthrough would have been welcome, but for the size, you can't really complain. 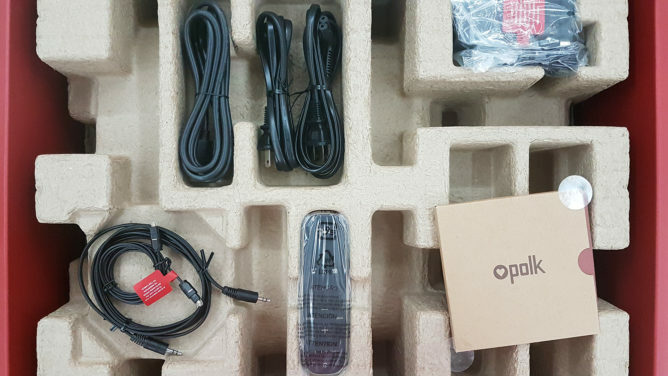 There's also a USB port used for service and support, an Ethernet port if you'd rather not rely on WiFi, and a WiFi reset button on the back. The subwoofer is wireless, so there's no direct input to it. You get a power port and two LEDs for standby and its sync status with the soundbar. Setting up everything with the MagniFi Mini was very easy and straightforward. The subwoofer found the soundbar quickly and in a few minutes, the Polk showed up in my Google Home app waiting to be set up. The process is the same as adding a regular Chromecast or Google Home: you teach it your WiFi password, give it a name, follow a few other steps, and it's done. I simply called mine "soundbar" because it makes things easier for Google Home commands. 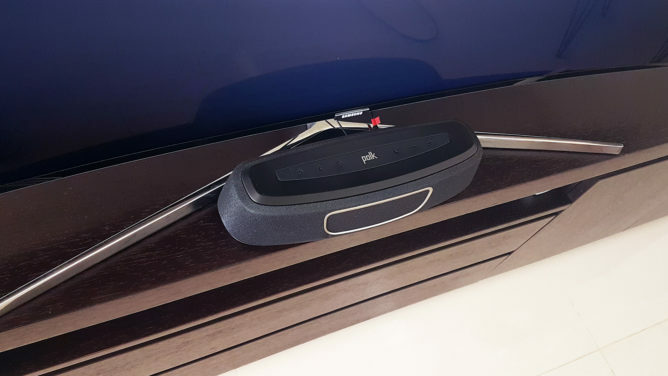 I also plugged the MagniFi Mini directly into the TV with the Optical cable. 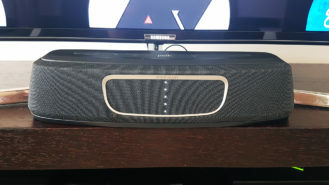 Without any input on my side, each time I turn the TV on/off, the MagniFi comes on/off as well automatically. That way most times I don't have to worry about grabbing the separate remote. However, I was slightly disappointed that the TV's volume buttons don't control the MagniFi Mini (I think I'd have to use HDMI for that, maybe?). On the other hand, if I wanted it, I could teach the Polk remote to control the TV — that's where those media playback buttons on the remote come into play. But I've already got a mess of remotes controlling each other (TV, NVIDIA, cable box, DVD player), so I avoided that. 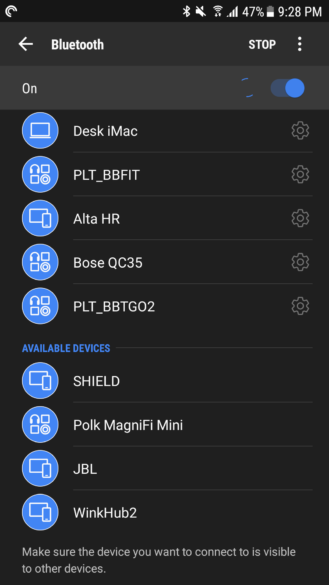 Setting up Bluetooth was also easy. 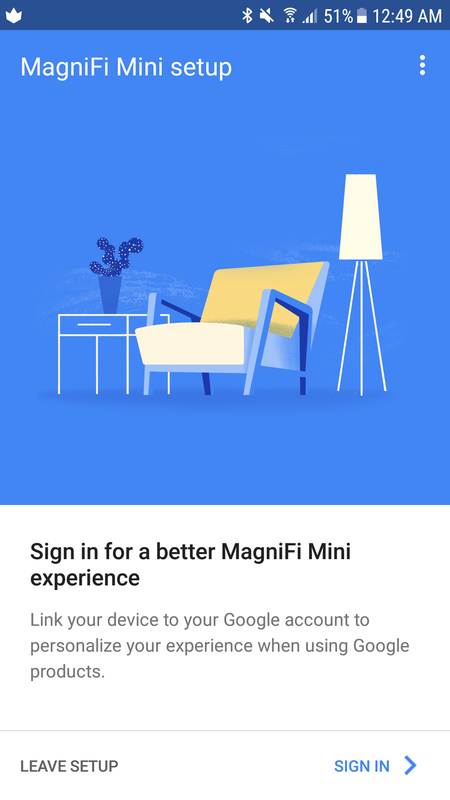 A simple press of the Bluetooth button on the bar starts pairing and the MagniFi Mini showed up on my phone's Bluetooth scan. It's not the most exciting connection method, but it's there in case you need it. With the cast setup out of the way, the MagniFi Mini became part of my fleet of Chromecast-enabled devices. 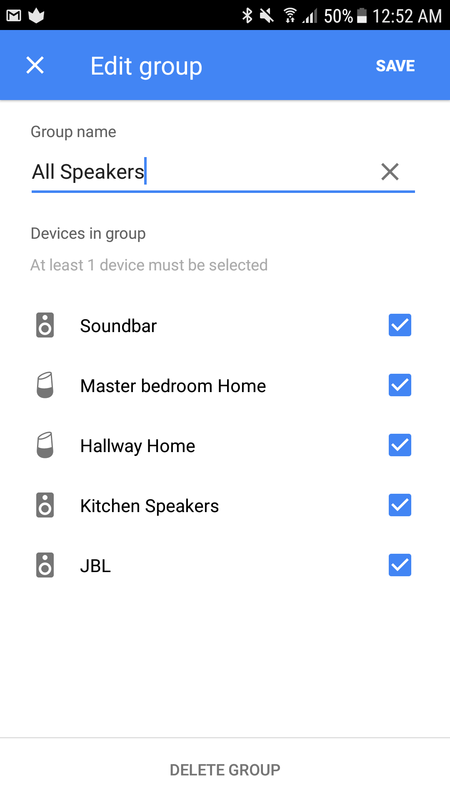 It supports grouping and multi-room playback so it was easy to add it to my "all speakers" group as well as my "living room area" group, for those instances when I want to fill the house with music or just the hallway and living room. Multi-room audio worked perfectly with it and I didn't have to correct or delay the audio to make it sync up with the other speakers. 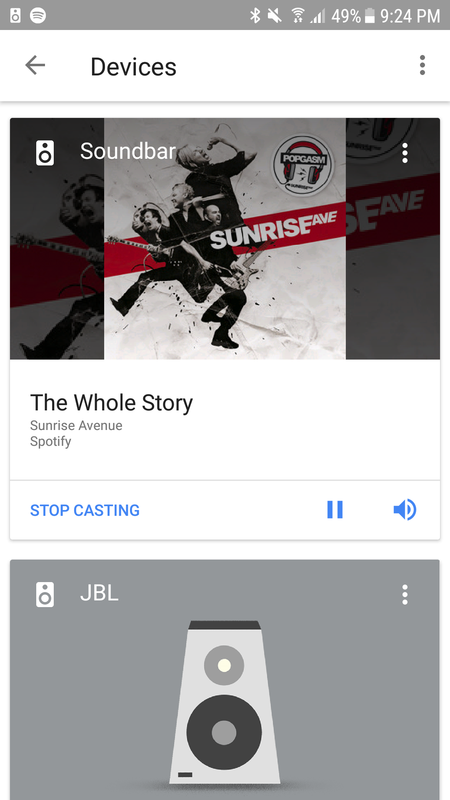 If you've ever used a Chromecast, you know how to look for the Cast button in many apps to send media to a certain device. 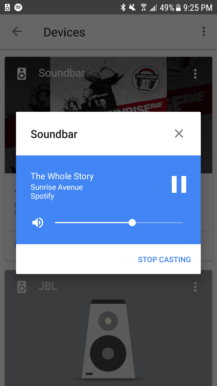 It works the same here and you can cast to the soundbar directly or to any group it's part of. 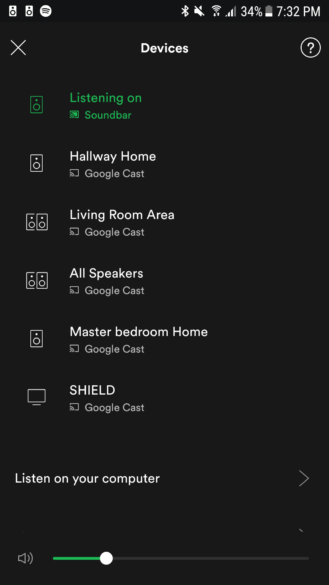 And like all Chromecast devices, you can also cast to it if it's in standby mode, so you don't have to power it on first. But my favorite way of listening to something on the MagniFi Mini has to be through Google Home. 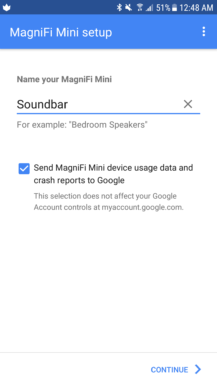 A simple "OK Google, play X on soundbar" turns on the MagniFi Mini from standby and starts streaming the artist or album or playlist I requested, just like that. 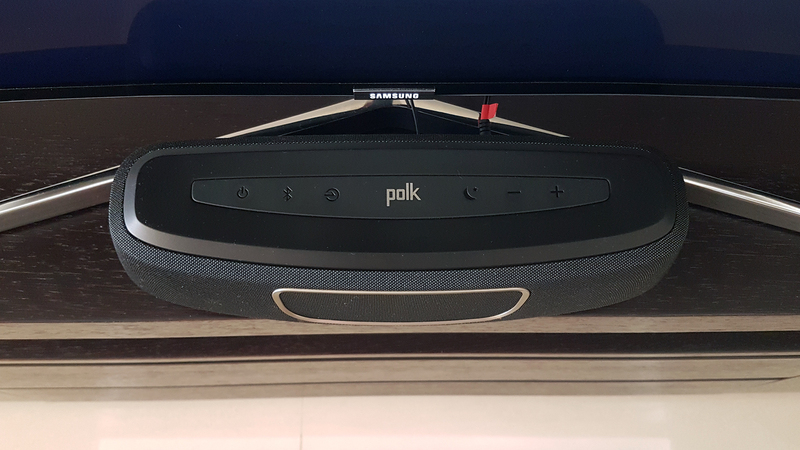 The convenience of having your soundbar, which is likely the largest and best speaker in your house, so easily controllable by voice is huge. I come home and simply ask for music and there it is. I can easily switch artists and genres while working, or stop and resume playback, no need to reach for a remote. It's a little magical, and each time I set some ambiance music when we have people over, they stare in disbelief as if I pulled a rabbit out of a hat. 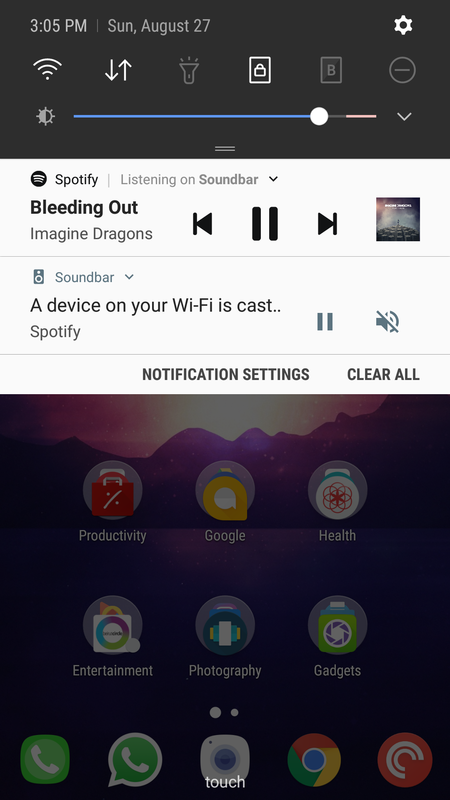 Any Chromecast built-in speaker also integrates in Spotify Connect's selection and menu. It's hard to find a piece of "new" technology that so easily wins everyone over and doesn't need to be troubleshooted every few days/weeks, but the Polk MagniFi Mini has been that for our household. It works as intended 100% of the time, which is surprisingly rare to find in this industry. Turn the TV on and it comes on with Optical input and starts pumping the sound of whatever we're watching. Turn the TV off and it goes off. 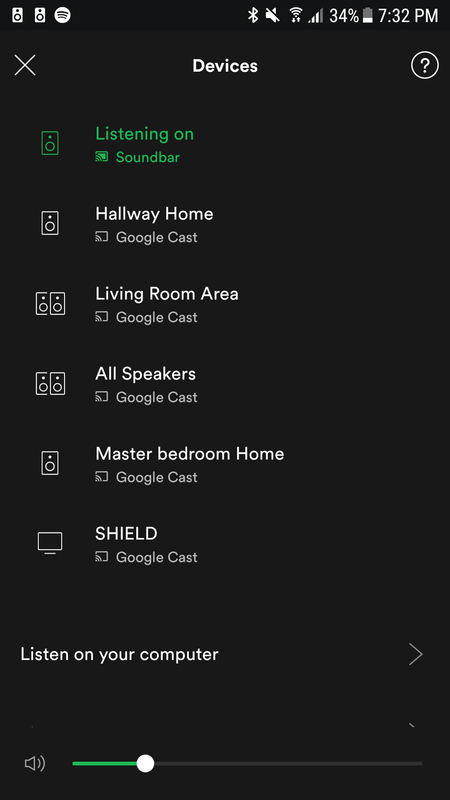 Ask the Google Home to play something on it, and it turns back on in casting mode and blasts our music. Ask it to stop and it stops. It's simple and we don't need to bother with manually selecting things. The only discrepancy or small niggles I could point at are due to Google's implementation of casting. Controls are sometimes redundant and often hidden, and you have to accept things as they are now. For example, while you get a notification each time something is casting on the network, that one only has pause, stop, and mute controls. 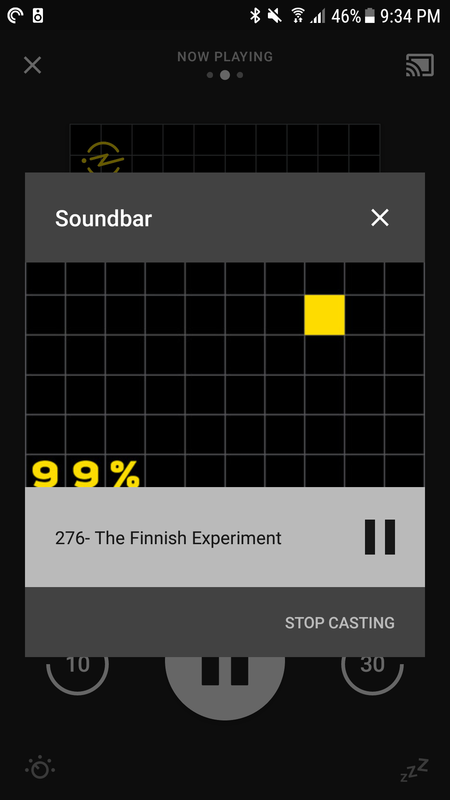 If you didn't have the casting app/service on your phone, you couldn't skip or rewind at all. And if you wanted to lower or raise the volume, you'd have to head into the casting app or into the Google Home app. 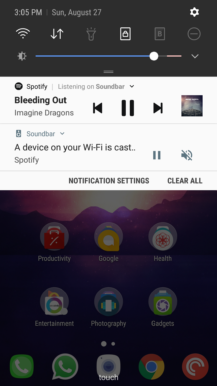 Google needs to add volume and playback controls in that notification. What good are all the input options and all the ports and all the excitement over the compact size if the sound itself was mediocre or horrible? Luckily, that isn't the case here and as a matter of fact, the MagniFi Mini impressed us much more than we expected. The first time we turned it on, we were sitting on the couch facing the TV, about 9ft away. I started raising the volume and the moment it reached about 90%, we literally jumped back in our seats. And I used "literally" literally here. For the next 30 minutes, we kept turning off the bar to hear what the TV's own 100% volume felt like, then turning it on and raising it to 100% to compare. We literally, again, jumped in our seat each time. The difference was night and day and it blew us away (hah, almost literally!). For such a compact bar, we were expecting a lower volume, a lesser surround feel, and less oomph. We were glad to be wrong. Since then, I haven't bothered to even test that again because I don't even want to turn on the TV's speakers anymore. I hadn't thought our TV's sound was bad prior to trying the MagniFi Mini, but now that I've gotten a taste of this, I'm hooked. Instead of feeling like the sound is coming at me from behind the TV, it's engulfing, fuller, and clearer. It fills the entire living + dining room and the open space in the hallway leading to the kitchen. It can also be heard from the adjacent balcony. Let's play "Spot the soundbar." It's that teeny black thing in front of the big 55" TV. Over the past weeks we've watched some movies (Blu-Ray, cable box, Plex on SHIELD), we've spent hours streaming TV shows and YouTube videos, we've seen many a football (the real one) match, we've played dozens of hours of games on the SHIELD, all on the TV with the MagniFi Mini attached. And each time the sound was perfect. Switching to Movie mode on the remote amplifies the dialogue and the action, while using Sports mode emphasizes the crowd's cheering and makes you sort of feel like you're in the stadium watching the game. Night mode comes in handy when binging TV shows because it avoids the loud burst during the intro and puts more focus on the speech. And the default setup is great for games: thanks to the big 55" TV and the full surround sound, you can often see my husband lean left and right while watching me play Riptide Renegade. No, he isn't playing, he's just watching. As a funny anecdote, we were once enjoying The Big Bang Theory episode where the guys go camping to catch the meteor shower (season 3, episode 8), and we had to pause playback 3 times because we kept hearing crickets. It was so eerily real and around us that it didn't even occur to us it could be coming from the TV. Yet each time we paused it would go away, so we eventually realized it was the soundbar's effect amplifying it from the show. Beside using it with the TV, we've also streamed plenty of music to the MagniFi Mini every day. 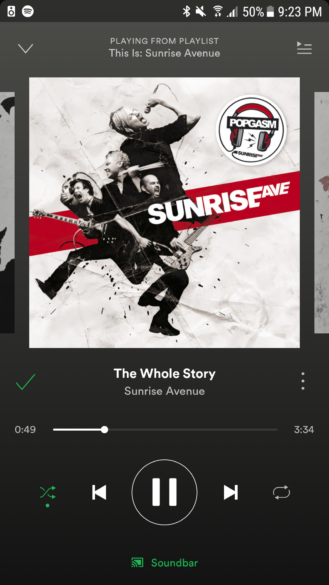 Jumping from Metallica to Nickelback to Sunrise Avenue to Imagine Dragons to Lorde to Kendji Girac to Nicky Jam to Il Volo to Eros Ramazzotti to simple acoustic violin or piano and sometimes to podcasts, the sound always felt balanced for all those different genres. Bass is full and reverberates in the entire room thanks to the subwoofer and it doesn't get muddied at higher volumes, though I rarely go over 70-80% of the full volume — I don't want my downstairs neighbors to hate me only a couple of months after moving into the apartment. Voices are crisp and very clear when listening to vocal songs or podcasts, and the highs are melodic and powerful. 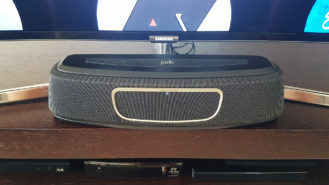 I never reached for the separate Bass +/- controls on the remote because the sound always felt balanced to me and didn't require my attention, but I tested it out before writing this review and discovered that you can tune down bass significantly should you want to. Music mode already turns it up so you can't really push it up further. All in all, I almost always felt that the sound balance of the MagniFi Mini was well tuned to each mode and circumstance I was using it in, and the team did a good job of adjusting the default equalizer settings for each one. For most people, and I consider myself part of that group, no further tuning or modification is needed. It just sounds good. 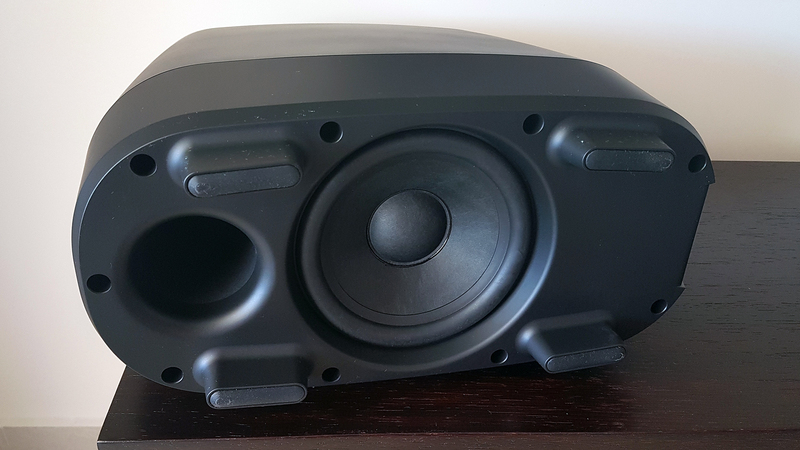 I've rarely reviewed a product that has impressed me as much as the MagniFi Mini. I always find something to nitpick on, things that are missing, features that don't work well, but the Mini left me scratching my head. It's too good and I wonder why despite how much tech and how many gadgets I cover, I had never heard of it until I actively dived deep in soundbar searches. If you're limited on space and want a soundbar with power, or if you don't want to pay a lot for the bigger soundbars, the MagniFi Mini is one of the best options you can look at. The various input options offer a little future-proofing and even without the Chromecast/Google Home integration, it works well as a simple soundbar connected to your TV. The different modes help it adapt to what you're watching so you can enjoy movies, sports, and games, while also being able to tune everything down with night mode. 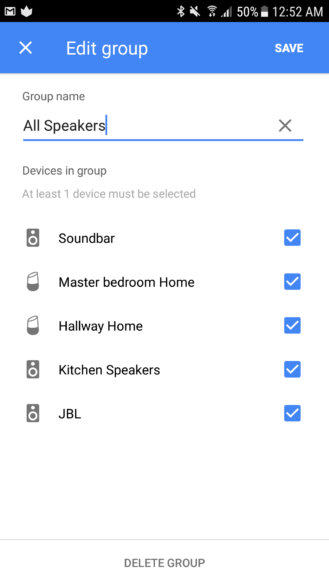 With Chromecast/Google Home integration, you get a smart soundbar that can pump music around your living room and a subwoofer that reverberates the bass around. 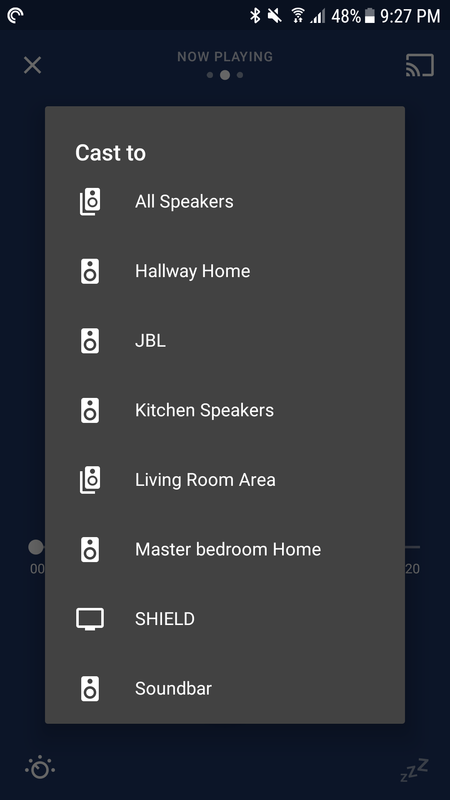 You also get voice controls to launch your music, multi-room audio, and a higher resolution stream than Bluetooth to enjoy your tunes. Try as I might, I can't find anything to fault the MagniFi Mini at. I'll stop gushing over it now and go back to enjoying my "Latin" playlist. Summer is nearly over, but there's always time to enjoy fun sunny-feeling songs.